A former Gaelic footballer, now a goalie in soccer's Irish League, has been talking about his nervous early days with a "Protestant" club. 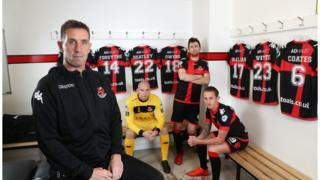 Sean O'Neill, a Catholic who plays for North Belfast side Crusaders, originally signed for Greenisland when he switched codes and, in a new BBC documentary, he recalls how he quickly found himself in what felt like totally alien territory. Filmed over the 2016/17 football season, O'Neill, who was brought up on Belfast's Falls Road, explains how his football talent was to take him across Northern Ireland's community divide in a way he previously couldn't have imagined. "To be honest, I know this might sound so silly, but I had probably never been in any Protestant's company. My family was gaelic, gaelic, gaelic. There was no soccer. Soccer was called 'the foreign sport'." All that was to change when the young O'Neill was at a GAA training session and was asked to stand in for a soccer team playing nearby who were short of a 'keeper. That team's coach also managed Greenisland and invited Sean to try out for them. He remembers the fear he felt when he first drove into the loyalist Greenisland Estate, in Carrickfergus. "I started to panic. At the time there were obviously all the UVF and UDA flags. You do think to yourself 'oh God, what have I got myself into? "Everyone was wearing Rangers shirts at training and I thought 'oh I don't believe this' in my pair of Celtic gloves. I was walking across and this coach, Starzy, was like 'Awh Celtic, you support Celtic. Good man.' It was just football." 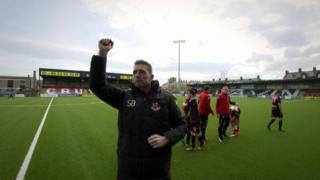 Sean O'Neill is now an established part of the Crusaders set-up but he says he is still singled out for extra 'stick', particularly from Cliftonville fans. "They have a go basically because I'm a Catholic playing for a Protestant team; it's as simple as that. All that does is drive me on." 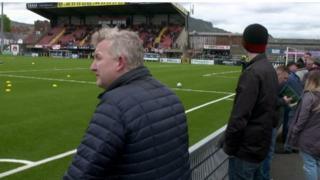 The programme also explores Crusaders' association with evangelical Christianity and the personal stories of some of the fans and players, including midfielder Matthew Snoddy who talks frankly about how a gambling addiction drove him to the edge of suicide. 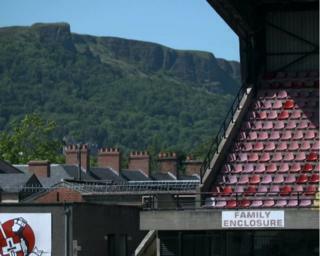 'True North: Crusaders - Keeping the Faith' is on BBC One Northern Ireland on Monday, October 23 at 22:40.